Today I left the house a bit early with the intention of getting some aircraft photos which I haven’t done in a long while. Instead of taking the two fifteen freeway around the valley, I chose the ninety five south to the fifteen freeway. Then instead of going south to Russell Road, I hopped off at Spring Mountain Road which I knew would land me on the Vegas Strip then south to Sunset Road and the airport. I have both airliner and Strip photos coming up soon. I was in my favourite photo spot waiting for the next aircraft flyover when. I snapped this photo. 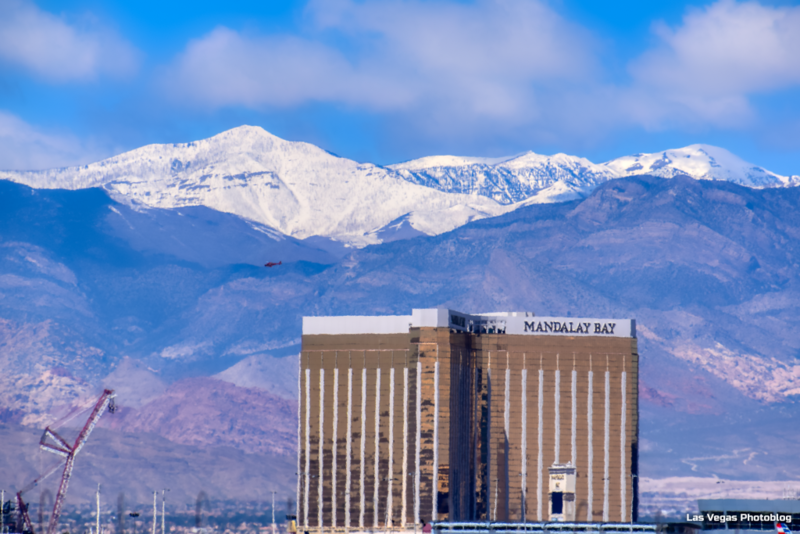 It’s fuzzy because I had the lens fully extended, and it’s a long way to the Mandalay from where I was but the snow capped mountain far away looked too good to not try for the photo.